Happy Winter! 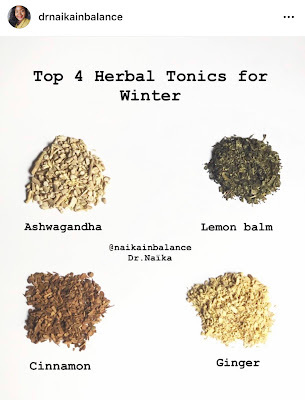 Here are my top 4 herbal tonics for winter, that will support your health and vitality throughout the season. 🌿Ashwagandha: Our adaptogen ally that will support our energy and mental/emotional wellness. 🌿Lemon balm: Our anti-viral that will support our immunity and digestion. 🌿Cinnamon: Our anti-oxidant source that will keep our blood sugar levels balanced. 🌿Ginger: Our plug for all the things because ginger does *ALL* the things. But namely to raise our yang energy and get that blood circulating. There are so many other great herbs that I’ll have in rotation in my tea kettle. But these are a great start! Wishing you a joyous, intentional, and abundant winter. Plant those seeds now so they may flourish in the spring!